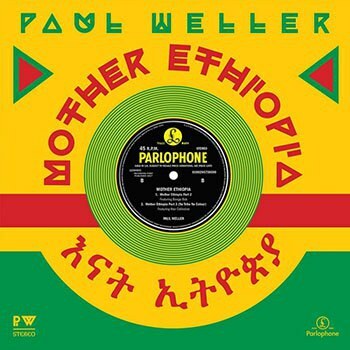 Paul Weller offers a homage to Ethiopian music on latest EP, Mother Ethiopia. The Ethiopiques series on the Buda Musique imprint is a series that has shined a well-deserved spotlight on the Ethiopian music of the '60s and '70s, since the first release in 1997. To date, there have been 30 entries as well as a very welcome overview in the shape of 2011’s The Very Best of Éthiopiques: Cult Hits from the Original Series. These compilations are very close to Paul Weller’s heart and have now inspired him to release this three-track EP. A release that sees him channel his creative juices in, yet another, different direction as he collaborates once again with like-minded British soul band Stone Foundation. Naturally, the EP marks a distinct change in sound from Weller’s previous album A Kind of Revolution. Wholly instrumental, the song that the EP is based on, “Mother Ethiopia”, finds Weller and Stone Foundation experimenting with different sounds and locking into the groove. Underpinned by a classic soul, organ riff, it’s an an effortless, soulful jam featuring circling Ethiopian rhythms and a bright and breezy trumpet. As the song progresses, various types of percussion, subtle wah-wah guitar, and stirring sax are thrown into the mix. It perfectly captures the open-minded, easy-going jam session that the song was born from. The second interpretation of the song features Bongo Bob, percussionist for Sylvester, Joe Satriani, and Starship amongst others. As expected, the song adds even more layers of bongos and other percussion, as well as some acoustic guitar licks which give the song even more swing and bounce. On the final alternate version, London based Ethiopian band, the Krar Collective add in some trademark Krar -- a six-stringed, Ethiopian Lyre that has a similar sound to an electric guitar but with a tone all of its own. More striking still are the gorgeous vocals from Genet Assefa sung in her native Amharic. The lyrics are a positive and apposite message for the times in which we live. A passionate plea for us to stop fighting, start appreciating what we have and duly live more harmonious lives, leaving whatever differences we once had in the past where they belong. “Mother Ethiopia” is a delightful homage to the Ethiopian music that Weller holds dear. It also illustrates a fertile musical mind still sitting on a river of ideas, happy to let them flow in any way they choose.